Sometimes you find what you think is an incredible deal on eBay. However a little research can help. It may well be a steal, especially if you know that the retail price is, say, $80 and you’re seeing a Buy It Now or an auction closing at $40. If a low, low price works for you, just go ahead and buy the item if you want it right away. To find the best price for any item on eBay, do your homework to find out what similar items on eBay (or Amazon) tend to sell for. When you conduct your eBay research, the best strategy is to look at the prices achieved in previous sales. Do a search for completed auctions. Then check an auction’s bid history by clicking the number of bids placed on the auction item page (the link appears next to the Winning Bid price). This will at least give you an idea of how many people are duking it out for the item, if not their actual IDs. 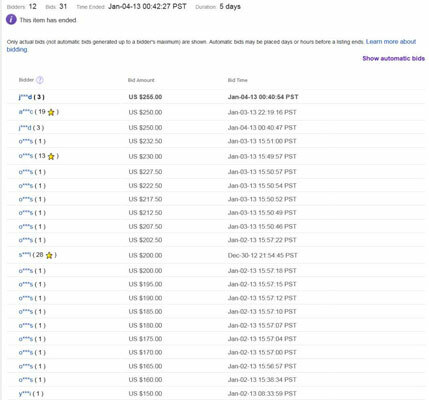 You should also click the Show Automatic Bids link on the right, so you can see how many bids were placed by proxy. Pay attention to the times when bidders are placing their bids, and you may find that the people bidding in the auction are creatures of habit — making their bids about once a day and at a particular time of day. They may be logging on before work, during lunch, or after work. Whatever their schedules, you have great info at your disposal in the event that a bidding war breaks out: Just bid after your competition traditionally logs out, and you increase your odds of winning the auction. Early in an auction, there may not be much of a bidding history for an item, but that doesn’t mean you can’t still check out the dates and times a bidder places bids. You can also tell whether a bidder practices sniping if his or her bid is in the last few seconds of the auction. You may have a fight on your hands if the bidder uses sniping.